Nourish your body, mind and spirit with carefully selected ingredients to offer a natural, clean, and toxic-free product. Small batches are made regularly to ensure top quality and freshness. Finding a natural skin care routine for yourself in an important step for healthy living. There are many known carcinogens in most store bought products, therefore it is important to educate yourself on what you are applying to your largest organ, the skin. Read this article from Mother Earth News to help you on your way to cleaning out some of the toxic burden in your home. This face cream has been enjoyed by all skin types, especially sensitive types. It can be applied daily before sunscreen and nightly after a gentle cleansing. It works fantastically for sunburns, windburns, and dehydrated skin. So get outside and enjoy nature, just don't forget to take good care of your skin! The Grounding Blend has properties that can help alleviate anxiety, depression, mood swings and helps to bring balance back into the body and mind. It is ideal for busy bodies and busy minds, and if your traveling a bunch, thats you! This rich cream can be applied to the entire body, however the feet are a great place to start. Essential oils are delivered faster through the bottom of the feet, so clean your feet and dry them first, then give your self or better yet, find someone else to rub down your feet and massage in this balm and sit back, relax and let the magic happen. 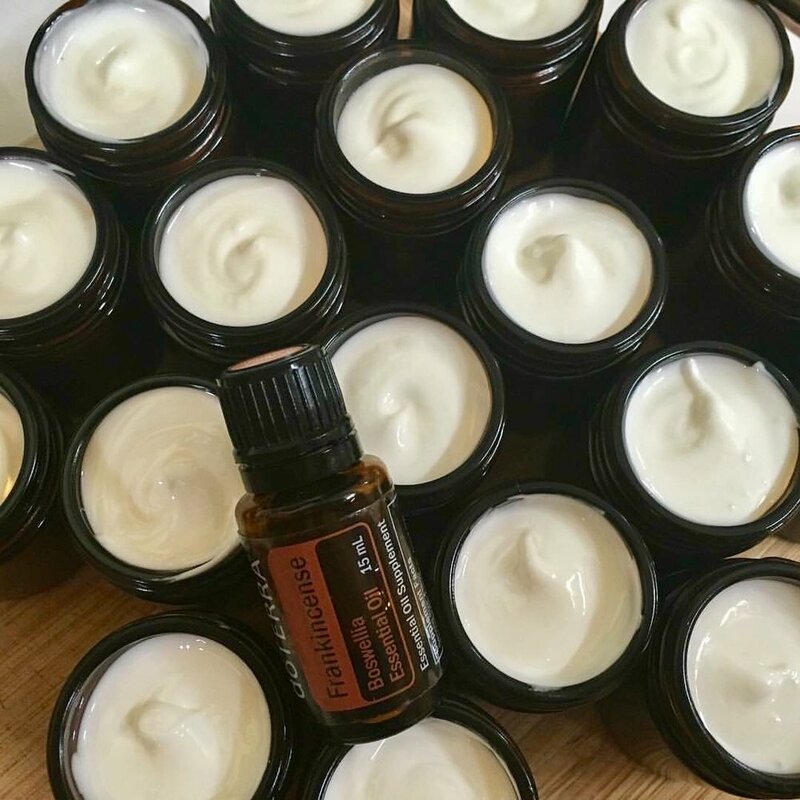 Another favorite use of this blend is to massage on the low-back to help the body self-correct its balance and alignment of the spine, great for labor as it connects the mother to her lower body. This calming belly butter has been has been used by many mothers to bring warmth and healing energy to the womb during pregnancy. As part of your nightly ritual, apply yourself or find a lucky soul to rub this amazing butter in a gentle circular motion, sending loving thoughts to the baby. Don't forget the other areas of your body that are growing, as this has been known to protect against stretch marks. By soothing and calming your growing and itchy skin, your body and baby will thank you. The coconut oil is used as a carrier oil to distribute the essential oils in a safe and effective manner. Geranium has been widely used for balancing of the hormones, it also enhances circulation and is good for labor management techniques that emphasize breathing for pain relief. Lavender is known to create feelings of peace and calm and calms the nervous system, while Clary Sage is a uterine tonic which can assist with effective contractions. This blend is to be used only after labor has started or after 40 weeks, you can apply it to the ankle bones on both feet. This spray bottle assists in creating an optimal atmosphere for the sacred time of childbirth. The Lavender can bring in a calming and soothing environment for the delivery room, while the Frankincense relaxes the mind and helps support the immune system. Regularly spraying this blend can help everyone in the room adjust to the new transition of the arrival of the baby. Continue to use for the transition of baby to home and keep the healing energy with you as long as needed. Support yourself or a loved one during this sacred time with these home-made products from nature that will support a beautiful birthing experience. Pregnancy recipes have been formulated with the help of Midwife, Stephanie Fritz.